Is there a better alternative to Chikoo? Is Chikoo really the best app in File Management category? Will Chikoo work good on macOS 10.13.4? Chikoo is a file organizer for the Mac. Multiple libraries: Create as many libraries as you want and organize whatever files you want in each. For example, organize your articles in one library and movies in another. Custom attributes: Chikoo does not limit you to a fixed set of hardcoded attributes. For example, organize your articles with respect to the author's father's name, or your movies with respect to the director's pet's date of birth. It's all up to you. The "Quick Look" tab in the Preferences has been replaced with a new, more general "Folder Access" tab. It turns out that access to folders is useful not just for Quick Look, but also for other things (see the next item). 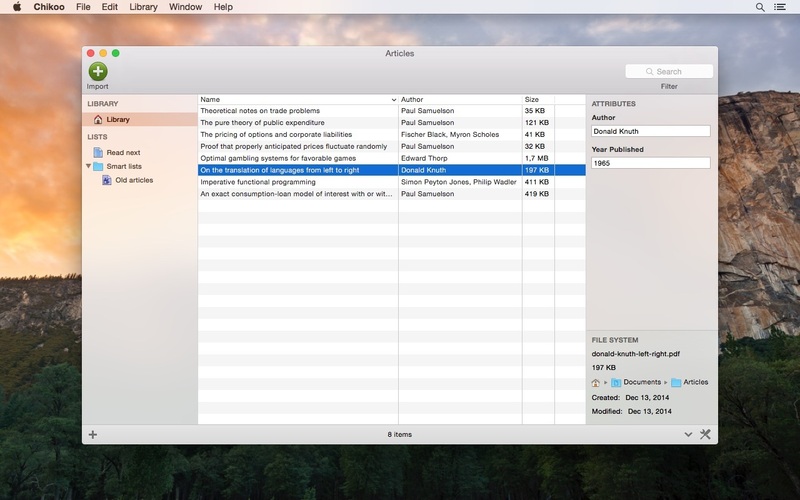 Type groups: Organize the file extensions of your files into groups of your choice. For example, put the file extensions "mov" and "mp4" into the "Movies" group, and "jpg" and "png" into the "Images" group. This feature can be useful when organizing multiple types of file within a single Chikoo library. Lists, smart lists, and list folders: Chikoo libraries have a sidebar in which you can add regular lists, smart lists, and list folders -- much like playlists in iTunes. Library folders: By default, Chikoo leaves files at their existing locations when importing them into a library. But you can also associate folders of your choice with a library, and have Chikoo automatically move or copy files into any of them upon import. With Chikoo, you have complete control over where your files are located on the filesystem. Quick Look: Press the space bar to Quick Look your items, just like you do every day in the Finder. That's not all. Watch our screencasts and download the trial to learn more! Chikoo is now more intelligent when attempting to locate files. For example, if Chikoo has access to the Dropbox folder on one Mac (--through the Folder Access Preferences; see the previous item--), the user will no longer be bothered about access to each file that is added to the library on another Mac. Packages can now be imported. In other words, things like rtfd or OmniOutline documents, which are not really files but package folders, can now be imported. Read-only and locked files can now be imported. The toolbar's contextual menu is now also available in the View menu. This has its benefits. For example, users can now hide/show the toolbar using a keyboard shortcut if they assign one via the Keyboard System Preferences. When a library window's toolbar changes in height or is hidden/shown, the window's height now stays the same. This makes toggling the toolbar more natural (see the previous item). The Command-F keyboard shortcut and the Edit -> Find menu item now bring focus to the search field (after showing the toolbar if it's hidden). Fixes a bug that makes it impossible to Control-click on a library window's toolbar to bring up the contextual menu.